It is no surprise that Canada and Mexico are very closely connected. Along with sharing the same continent, Canada is home to some 100 thousand Mexicans and is one of Mexico’s top trading partners alongside the USA. This is in addition to the popularity of Mexico as a retirement or tourist destination for many Canadians, with some choosing its sandy beaches as their wedding venues. Regardless of the purpose, whether personal or corporate, affairs in Mexico often require numerous documents such as birth certificates, marriage certificates, death certificates, divorce certificates, pension documents, certificates of incorporation, certificates of origin, commercial invoices, board resolutions, powers of attorney, and tax residency letters that must first be made valid for use in Mexico. Most documents issued outside of Mexico require an apostille. However, since Canada has not signed the Hague Apostille convention like Mexico did, any Canadian documents that need to be used in Mexico will have to go through the original and equivalent process of authentication and legalization. In theory, authentication and legalization of a document is simple: authentication takes place at Global Affairs Canada, and legalization occurs at the consular section of the embassy of Mexico. In practice, it can be very confusing, stressful, and time consuming: Global Affairs Canada can take up to 20 business days and has a series of requirements before they can authenticate a document, while the embassy of Mexico has its own requirements as well as fees which change very frequently. In practice, authentication and legalization can take months without assistance and this can be a very big problem if you have deadlines to meet. As our name suggests, we at ALSC specialize in the authentication and legalization of all Canadian documents for use in Mexico. We are the first company to provide this service and for over 25 years we have helped hundreds and thousands of Canadians, thousands of corporations, dozens of celebrities, and even former prime ministers with their foreign affairs. 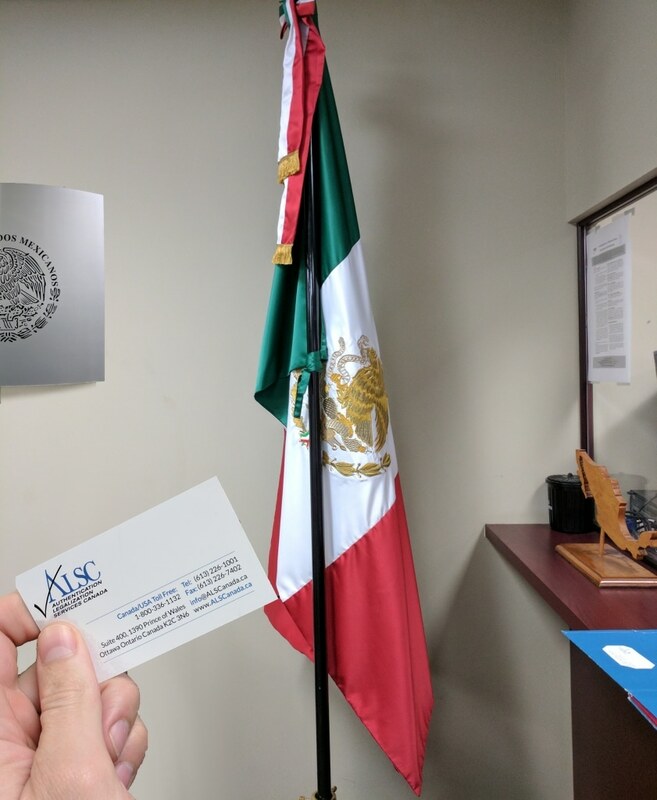 For over two decades we have built close relationships with employees at Global Affairs Canada and consular staff at the embassy of Mexico here in Ottawa, minutes away from our head office. We are experts in virtually every Canadian document whether personal or corporate. Documents such as birth certificates, marriage certificates, death certificates, divorce certificates, various incorporation documents, Medical Device Licenses, ISO certificates, CPP, GMP, and ITC are our speciality. On our priority service we can have your documents authenticated the same day they arrive at our office and legalized by the Mexican embassy within days. This can save you weeks of processing time that you could otherwise face. When you use our services, you get your own personal agent to answer any questions and concerns you may have as well as keep you updated every step of the way. Our service guarantee ensures your documents are ready for use in Mexico and we can ship them anywhere in the world through one of our shipping partners upon completion. If you are rushing to meet a deadline we recommend you contact us immediately. Below you can find more information on Canadian documents you may need to use in Mexico and how we can help. Mexico’s growing and diverse economy makes it an attractive avenue for new ventures for many Canadian businesses and entrepreneurs. Mexico’s recent emphasis on health and well being has made it an attractive destination for pharmaceutical, medical, and other health-based business. If you are a Canadian business or entrepreneur looking to Mexico for purposes of expansion, maintenance, or partnership, you will need to provide documentation to the appropriate parties in Mexico. The documents you will need and where they will need to go will depend entirely on the requesting parties and their associated processes. These documents can include but are not limited to: certificates of incorporation, certificates of origin, commercial invoices, certificates of amalgamation, agreements, board resolutions, powers of attorney, and tax residency letters. At ALSC, we have over two decades of experience working with businesses in the pharmaceutical and medical field. As such, we also specialize in various pharmaceutical and medical documents for use in Mexico such as certificate of pharmaceutical products, medical device licences, GMP, CPP, ISO certificates, and SCC certificates. Regardless, if your documents are Canadian they will first need to be authenticated at Global Affairs Canada and legalized at the consular section of the Mexican embassy here in Ottawa. Prior to this, your pharmaceutical and corporate documents will require notarization by a lawyer or notary public. If you need assistance with notarization services just ask one of our friendly agents they will be able to provide you solutions. If you do not yet have your corporate documents such as your certificate of origin, commercial invoice, or corporate power of attorney it is fairly easy to obtain them. Many of the documents you may require are issued by Industry Canada as well as other federal bodies. There are various resources available online, most notably from the Canadian Government itself, that also provide templates to many of these documents. Once completed, these templates can then be reviewed and signed off by a lawyer who can also create these documents for you, usually at an additional charge. The Canadian Chamber of Commerce also has a “Certification Made Simple – TradeCert” service which can certify documents such as Canadian Certificates of Origin for use in Mexico. Along with providing useful forms and templates of their own, the Canadian Chamber of Commerce can also sign your corporate documents if they meet their requirements. Global Affairs Canada has the signatures of the Canadian Chamber of Commerce on file which makes them valid for authentication and subsequent legalization at the consulate of Mexico. As proud members of the Canadian Chamber of Commerce here in Ottawa, we can pick up your documents free of charge directly from the Chamber once they have been signed. We can even process your forms for you at the Canadian Chamber of Commerce if you send them to us via email. If this is your preference we ask you indicate this when you contact us. Please note that if you want to use our service to ensure there are no errors and minimize delays, we will require a scan of your documents to check if they are ready for processing. We do this with the highest confidentiality possible and take every security measure at our disposal. Our extensive base of personal and corporate clientele is testimony to our commitment to professionalism, trust, and efficiency. You can rest assured knowing your business dealings in Mexico are safe with the best team in our industry. Canadian vital statistics documents such as birth certificates, marriage certificates, divorce certificates, and death certificates are the core documents required to address most personal affairs abroad. For Mexico, this is no exception. Whether you are applying for Mexican citizenship, interested in retiring in Mexico, planning a wedding, or looking to resolve inheritance and estate matters related to the passing of a loved one, you will need at least one of these documents. Canadian application for IMSS, or Instituto Mexicano de Seguro Social, also requires the authentication and legalization of vital statistics documents for use in Mexico. As a popular social security program offering healthcare to Canadians retiring in Mexico, IMSS applications require an authenticated and legalized Canadian birth certificate along with other documents and forms which can be found by clicking here. Canadian IMSS applications for Mexico must be renewed every year and are only accepted within a limited time frame. This can get very stressful as the process of authentication and legalization can sometimes take months to complete. If you are in the process of renewing your IMSS benefits and need to have your Canadian birth certificate or other Canadian Vital statistics document authenticated and legalized for use in Mexico, we strongly recommend you contact us. With our services we can have your birth certificate authenticated on the same day it arrives in our office and legalized by the Mexican embassy here in Ottawa within days. Don’t wait until its too late! Despite vital statistics documents being the most important documents that can be issued in your lifetime, it is common that they can’t be found when they’re needed or badly damaged from handling over time. Luckily, it is very easy to order a new Canadian vital statistics document. Note that your birth, marriage, divorce, or death certificate must be ordered from the province in which it was issued. Also, marriage certificates and death certificates must come from the provincial government since certificates issued by the church or funeral home are not valid for international use and will not be accepted by Global Affairs Canada even if they are notarized by a lawyer or notary public. All provincially issued vital statistics documents contain signatures which are recognized by Global Affairs Canada and do not require any additional processes like notarization. If you need to order a new birth certificate, marriage certificate, divorce certificate, or death certificate for use in Mexico, we strongly recommend you have it shipped directly to our office to save you time. Many of our clients do this, and those who do are glad they did! Use the links below to get started on ordering your Canadian vital statistics document for use in Mexico. 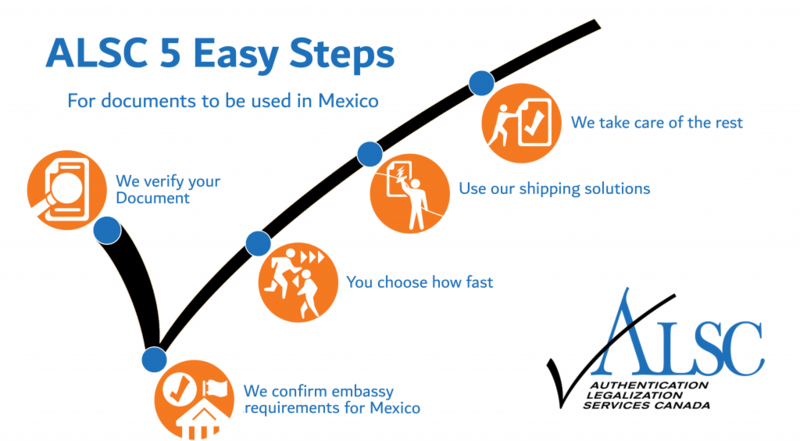 Fast Canadian Document Apostille, Authentication Legalization For Mexico – Get Started Now! At ALSC, we know that the authentication and legalization process can be very difficult even if you’ve gone through it before. Every day we are contacted by businesses and individuals who are scrambling to resolve their affairs in Mexico. Every time, we make sure that they do. There are countless advantages to using our services. Our diverse team of agents allows us to serve you in French and provide assistance in Spanish. Our close relationship with the staff at the Embassy of Mexico allows us to extend the same benefits to you when you use our services. Our membership with the Canadian Chamber of Commerce emphasises our ability to understand and address business affairs in foreign countries, while our countless testimonials on Google and Facebook make it clear that we are the leading provider of this service in our industry. The diversity and commitment of our team is only rivaled by our accessibility, which is also unmatched in our field of work. If you live in or near Vancouver, Victoria, Surrey, Calgary, Edmonton, Regina, Winnipeg, Toronto, North York, Mississauga, Halifax, or Montreal, we have service centers that allow you to drop off your documents and have them shipped free of charge to and from our office by FedEx priority courier. Our service centers function as a one-stop-shop for authentication and legalization: both processes done for you in one simple trip. Please note that you first need to make an appointment to use our service centers. If you arrive without an appointment we may not be able to accept your documents as there are requirements that must be met prior in order for us to process them. Upon completion you can pick up your documents at our service center or we can have them shipped anywhere in the world via one of our shipping partners. We promise to provide you with the highest quality service available while saving you valuable time that you can enjoy with your friends, family, and hobbies. Our specialized team at ALSC will ensure your pharmaceutical documents arrive early for your colleagues in Mexico to start working on getting your product to market faster. Click below to get started now with Apostille, Authentication and Legalization of your documents for use in Mexico!